02-Jun-2014 -- After driving through the small town of Lund (dutifully adhering to its ridiculously low 25 mph speed limit), I turned northwards onto a series of dirt roads, following - in reverse - the waypoints that Shawn Fleming and Sam Gallucci's noted from their visit almost 10 years earlier: [38.9021,-115.0326], [38.9516,-115.0130], [39.0015,-115.0157]. Note: The final dirt road - starting about 1 mile west of the point - requires a fairly high-clearance vehicle, but the other roads could be driven with just a 2wd vehicle (which would leave you with a 2-mile round-trip hike). With my 4wd SUV, I was able to drive to within 100 meters of the confluence point. 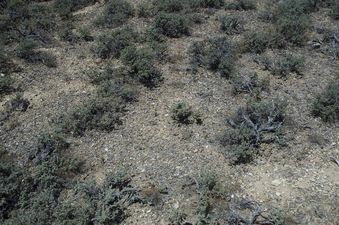 #1: Yet again, desert sagebrush!